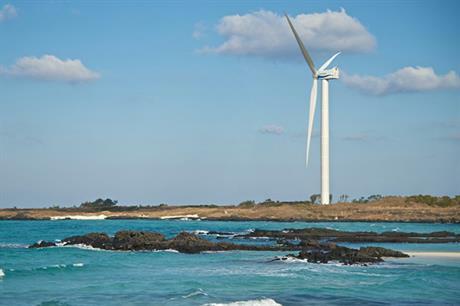 SOUTH KOREA: Hyundai Heavy Industries (HHI) has installed its 5.5MW offshore wind turbine prototype on Jeju Island, South Korea. With a 100-metre hub height and 140-metre rotor diameter, it is the largest wind turbine ever installed in South Korea. HHI will commission the turbine in March in order to test it for certification by authentication institution UL/DEWI-OCC before the end of the year. Installation of the turbine was originally planned for mid-2013. US firm AMSC Windtech has worked with the Korean manufacturer on the development of the turbine. It has a rated wind speed of 11.75m/s, but the turbine is designed to withstand winds of up to 62.5m/s, well into the hurricane force band, the manufacturer said. A specific power rating of 357W per square metre gives a medium value in between a current range of around 300-380W per square metre found for several recently introduced or announced 4MW-plus offshore turbine models. The compact drivetrain comprises a cast main carrier as main structural element. It incorporates a flanged three-stage gearbox and main shaft that comes as a semi-integrated assembly, while a high-speed generator is mounted on a separate bolted-on generator frame. The company plans to market the product in two distinct stages. The first stage focuses on the domestic market, to be followed by a second push in the north European market. HHI and AMSC have previously collaborated on 1.65MW and 2MW wind turbines. Dongfang has also used a very similar 5.5MW design, developed with AMSC, for its latest turbine.